Did we enjoy ourselves? Oh yes we did. Did we laugh out loud? Most certainly. 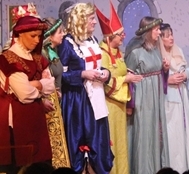 A good panto has the audience going out still smiling and in good spirits. And the audience was most certainly doing that after Camelot. Although not one of the classic pantos, which made me slightly nervous at first, author Ben Crocker is an accomplished writer of both traditional pantos and the more unusual, and this was a winner. But to set the scene with the scenery. How do you depict a castle, a haunted hotel, Merlin’s chamber, and forests all in the Village Hall? The team, under director Keith Russell, came up with in ingenious set with flaps that folded in and out to make different locations, and a screen that swivelled down on which forests were displayed with computer trickery. And so we were able to move quickly, well fairly quickly, from scene to scene without hold ups in the action. Vicious, also wants to marry Guinevere. To help him in his quest he has a forged magic document that isn’t really there, that has been conjured up by Morgan le Fay. The baddies are clearly lined up on one side, with Morgan le Fay, Valerin’s mum, and two knights, one big and bad knight and the other, well, invisible, supporting Valerin. The goodies on the other side are Arthur, his father King Uther, and Merlin. So there was plenty to boo and cheer when either heroes or villains took to the stage. Then there were the comic turns of a mute Teddy and her minder Connie, the panto dame, who, together with Laughalot the jester and Nell, were able to play everything for laughs. 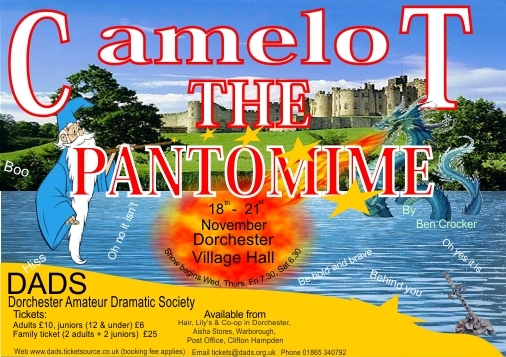 Just as a panto should be. Laughalot’s frail nerves meant that he needed succour from the audience whenever he was faced with a challenge, giving lots of opportunity for the audience to shout: ‘Be bold, be brave’, at which point Mike Davies’s Laughalot miraculously turned from a quivering wreck into a man of steel. You knew it was coming, but it was still funny every time it happened. But isn’t that the point of panto? Something familiar that you can laugh along with no matter how many times it happens. Of course a riddle was set: how could Merlin go forward whilst going backwards? This was resolved by old Merlin going back into young Merlin in a puff of smoke. Mike Selway, turned into a bold young Fraser Beland, who gave an assured performance in his first DADS production. Another newcomer to DADS was Frae Elford, playing Guinevere. As one of the central plot characters there was less scope for playing this for laughs, but she gave a strong rendition of a princess who isn’t sure she can really trust her husband-to-be after she catches him spying on her. Christine Jones, as Guinevere’s maid, had scenes where she was able to give us laughs, as she played up to Laughalot, her beau. Christine has an ability to convey what she is thinking through her facial expressions and in this production that meant making good use of her comedy face. Amongst the baddies, Rosemary Mills exuded evil, dressed in a marvellous black costume that you just knew had come straight from Hades. She was so evil you couldn’t resist booing every time she came on. Johnny Cornelius’s Valerin was ambition with a Black Country accent, so you knew he was never going to get the girl. He didn’t came across quite as evil as Morgan le Fay, so his conversion at the end to the side of light was not as big a leap as it might have been. Ann Winslet’s simpering mother, though, made me laugh from the moment she first appeared. Jim Levi was solid and dependable as King Uther, as the old king should be, and Rachel Winslet-Morris lit up the stage, playing a compelling and wonderfully likeable Arthur. 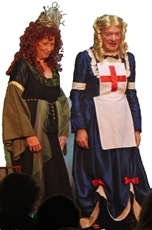 But as with any pantomime, the role that links it all is the dame, or in this case Connie Clatterbottom, played by Mark Williams, with Jane Brooks as sidekick Teddy. Jane did not have a lot of lines – well none, as Teddy was mute, but gave us plenty of action. Mark’s Connie was a sight to behold, with a version of a nurse’s uniform supported by big boots. He commanded the stage and the sheer absurdity of the costume helped him to do that. He played Connie as a cross between Lily Savage and Eric Morecombe, which made it hugely enjoyable, and you looked forward to every scene he was in. The haunted hotel bedroom scene, which was the heart of the fun and games, was well paced and had the audience in stitches. Getting three people into a bed that keeps disappearing and returning with a change of personnel is in itself quite some undertaking for a village panto. Behind the scenes must have been chaotic, but It usually looked to the audience to be the correct set of characters coming back on. But then in a panto it doesn’t really matter. 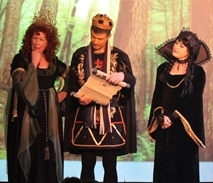 The chorus worked hard, as they do in pantos, doubling up in several parts such as the talking clock, the dismembered head of Nilrem, a snake, and the bishop (inspired casting there), and seemed to be having great fun themselves as they moved between roles. With eighteen people in the cast it must have been a big job directing them all. Keith and assistant director Sue Kitson managed to corral them all and, at least on the night I was there, got everyone on and off stage on cue, and managed to keep the pace up. If I have to be picky about one thing, it is that not being one of the classic pantos I thought it a bit short of the traditional ‘behind yous’ and ‘oh yes he did, oh no he didn’ts’ to draw in the audience. But I can blame Ben Crocker for that, and it didn’t stop us from leaving the Village Hall with big smiles on our faces. Another successful and entertaining production from DADS.